This guide is meant for users and customers who usually report that their email alerts are not coming through or have stopped coming. This usually happens when the messages are rejected by your email service provider. Our servers will try several times to deliver the messages for a given time-frame, but if the delivery constantly fails, it will mark it as "old", "rejected" or similar, and it will store your recipient email address in our Bounce List. The points below will help you understand and prevent email-related issues. 1. First, navigate to SETTINGS > EMAIL page then open the email alert you want to edit. 2. Go to the RECIPIENTS tab. Make sure the SENDER NAME, REPLY-TO EMAIL and RECIPIENT EMAILS are all filled out. 3. Afterwards, go to the ADVANCED tab and scroll down. 4. Make sure the SENDER EMAIL is properly set. Click the SAVE button once you're done. IMPORTANT: When testing email notifications, you have to do an actual submission to your form. Clicking the TEST EMAIL button found on the notification wizard will ONLY send emails to the email address that is associated with your JotForm account (the Primary email address). Simply open your form in "live mode" (click on "Preview"), fill out the form and submit a test entry in order to see if the notifications are being sent correctly. You should get the notification on the specified email address. I changed my email on file and now I can't login using my email. I get the emails from the test links but not the forms!!!!! Come on JotForm, please sort this out. Problem solved. Very helpful link. Has the known issue of emails not being received by yahoo email address been resolved? Pelo que vemos o problema persiste e ninguém resolve. Alguém tem alguma alternativa de formulário pra sugerir? I've tried this as well- and Nothing- I even tried numerous email smtp and the jotform one. Nada coming thru. I have done everything mentioned above, but still no emails ?? This has been a problem with Jotform for three years now. How about a permanent fix? Hey i've tried this and still nothing? Can you make sure my email isn't on your block list? I have literally followed every step in this guide, and I am still constantly missing form submissions because our company's emails are continuing to be put on the bounce list. I have seen that I am not the only user with these issues. Please make this fix a priority. Hi so I had this issue with email addresses being added to the bounce list as well. I followed the instructions above including adding the domain names to our white list. But my email addresses are still being added to the bounce list. Is there anything else I can do to prevent this from happening? I do not want to give my e-mail here as I am getting spam as it is and putting my e-mail here will bring more spam. My solution was to change the e-mail address and now it works again. However this is not first time when happens in last 3 years. Somehow once at 6-9 months I have to change the incoming e-mail- so this should be a solution for others too. I thought that paying will make a difference in service- but it doesn't. I recieved my last form on my email on feb 22. Since then for some reason they are not comming in. I see the activity sent email log on my account and they randomly fail but I don't recieve any of them. I turned off encryption on my form, same thing. I randomly send emails from other accounts to my Jotform email and I recieve them. I tried changing the notification settings to various things but no luck. Any suggestion will help. Thank you. i keep getting unencrypted emails from places of businesses that would normally not do this, and in past I've received encrypted emails from them, specifically rogers.com is sending these and this has to do with my billing info so its confidential so can someone explain this to me and also when i look at sender it says reply to : and then also a mailed by: which says bounce.et- before the .com what is this? and also when viewing an outside website directly from my emails it says certificate problem with the site. whats happening? The customer is not getting the jotform email with all the details on it, I have everything set up like the instructions say, can you please see if earcandycabs@hotmail.com is on a bounce list? I created notification and successfully did the test, but when submitting a for I never receive submission? I tried these suggestions and nothing, My email is not getting the forms anymore. Any other advice? WOW.. thnk so much.. it solve my problem..
We are having issues with our forms, and getting alot of complaints! In the notifier email: We have manually input the recipients email where we want forms to be sent and this is not working!!! Any suggestions?! I'm using the app "email verification" but the sender email confirmation that i have received is not mine, but from JotForm. How can I change this? Anyone else not receiving emails from @yahoo.com addresses? I discovered I was getting all email submissions but NOT ones submitted from people with yahoo.com addresses. No big deal... just like the top 3 email services on the internet and we are not getting reservations from them. Jotform is dropping the ball. 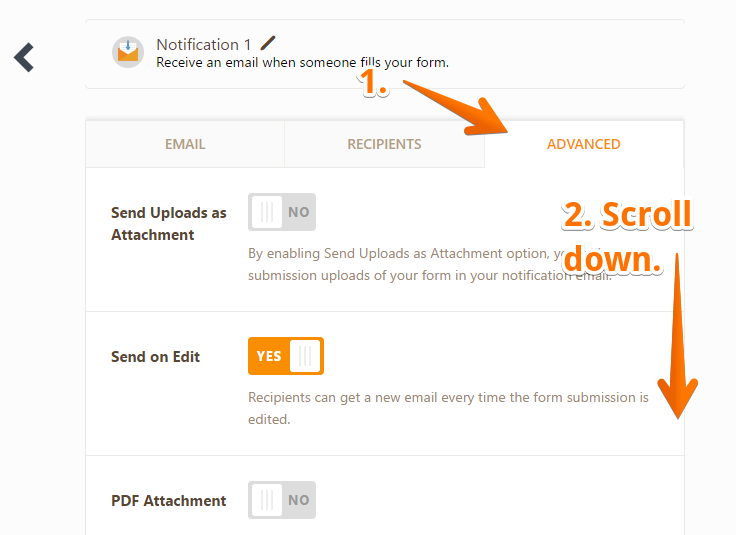 How about a notification tab in jotform that indicates if jotform received a bounced email from an account? I assume from your sender log, that you know which account the email was sent for. It would take a bit of programing but would eliminate a lot of customer requests to see if they are on the bounce list. 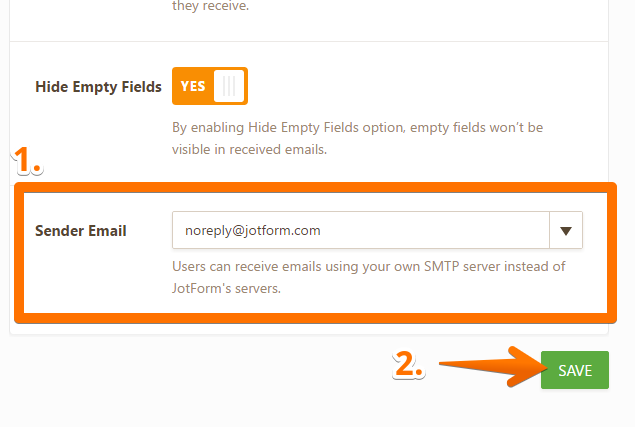 For some reason when we use the "noreply@jotform.com" e-mail address with any form that is less than 6 fields, the e-mails do not come through. Can you think of any reason this might be happening, or is this something weird with our IT system? I'm having the same issue. Using the preview button and sending a submission works great, but on my live site it won't work. Hello. Same issue here with my "Tell Us About Yourself" form. Can you please check your logs? Thanks. Can you see if mathias.lyngmark@boliden.com is on your blocked list, and please remove him if that is the case. It works to a lot of addresses on the same mail server, but just his stopped working a while ago. how do i edit existing email notification settings without adding additional notifications? Same problem. Please help! :( I cant receive any emails if people fill up my form. 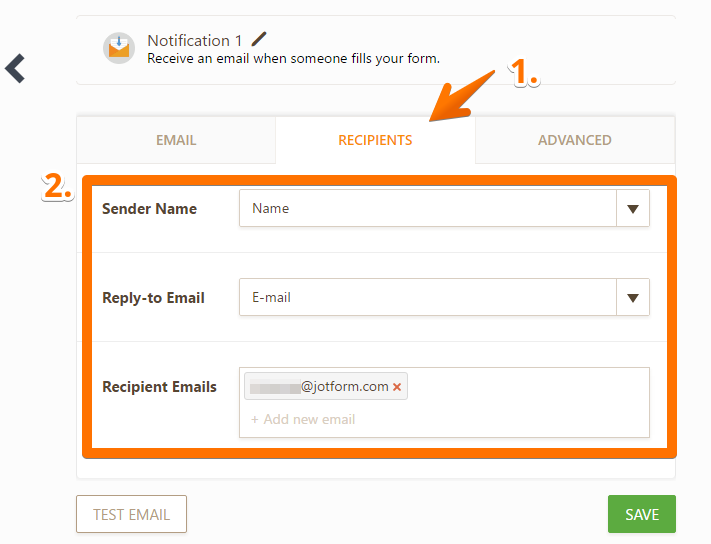 How i can to setup for the e-mail alert without "noreply@jotform.com" ??? can you please remove info(at)harryslajolla(dot)com from your blocked list. Hi There, my email is a business one, and I received only a few test emails, please advice on how to make it functional. Tried filtering as well. I have followed these steps and still no email. The submissions are in my account but have not gone to my email address. Have you tried verification of email addresses via http://GreenAppleMail.com? HI it is still not working. I am not getting any mail on my mail ids after clicking on submission. how do i send email notification to different email address ?? what if I changed my email in profile, why is it still giong to the one I registered with, am I stuck with that email forever, because it keeps going to that one. I want to send this particular form to another address. I tried to use filter and canned message in gmail to send an auto confirmation email from my email to the person who submitted the form (filter the notification email). Then the email says send to noreply@jotform.com or noreply@jotmail.com and I didn't receive that email. How can I change that? Tks? Why are we not receiving emails from Jotform? Why am I intermittently not receiving email notification of a form submission?